Wow! I apologize for not writing for so many days. It’s been a busy week! Where should I begin? Tuesday morning we had to head to Grand Rapids first thing in the morning to get Jacob’s blood counts checked. We were there for over 2 1/2 hours. It made for a long day. Plus, we had Caleb with us. Anyway, his counts were low. They seemed concerned, but I wasn’t too much especially since we usually get them checked on Thursdays and it was only Tuesday. So they informed us that we’d have to go back on Friday (today). Since we are currently at my Mom and Dad’s, there was no way that I was heading back to G.R. (1 1/2 hours away). So we had to go to Ludington (20 minutes away). I’ll get to that in a moment. Back to Tuesday, we went back to my sisters and just relaxed. Wednesday we got up and packed our things and left after lunch for Grand Haven. That’s where Jacob’s fishing trip was. Rachel and Jayden came with us and my Mom and Dad met us there since my Dad was fishing with Jacob. Of course the first thing the kids wanted to do when we got to the hotel was swim. They had such a good time! I think it was great physical therapy for Jacob. Hopefully we can get him in a pool again soon. We all went out for dinner and then went down to the pier where the St. Jude salmon fishing tournament was taking place. We all got an ice cream cone and enjoyed our walk. Thursday morning came and unfortunately, my Dad and Jacob had to get up really early for the tournament. They left the hotel by 5:40 am. When I woke Jacob up, he was upset that he agreed to do it since he was so tired. But once he was up and more awake, he was excited. Thankfully it turned out to be a gorgeous day with little wind. While they were gone, we did some swimming and had a great time! We ended up meeting Jacob and my Dad at the pier at noon just after they got back. They had a wonderful time! Jacob caught the biggest fish on their boat. It was only 6 lbs., but he didn’t care. Thankfully he didn’t get sea sick. 🙂 We all ate lunch by the pier and just enjoyed the day. Better yet, we got to take home the catch and had it for dinner. It was delicious! We got to my Mom and Dad’s in Pentwater at around 4:00. My sister Liz, Jared and Abbie came after dinner. So nice we could all be together! Okay, now it’s Friday. 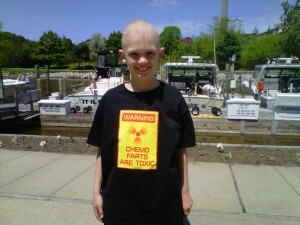 Jacob, Caleb and I headed to Ludington this morning so Jacob could get his blood counts checked. Of course it couldn’t go smoothly. We had to wait for quite a while in the waiting room and I’m sure you can imagine just how patient the boys were. Caleb kept complaining how hungry he was. I would just say “I’m sorry!”. I didn’t really care a whole lot since he didn’t finish his cereal, so lesson learned or so I was hoping. He would get upset when I would say that and say “Don’t you even care that I’m starving to death and that I’m going to die?” DRAMA!!! Anyway, by the time we got into the lab, I was worried that the numbing cream on Jacob’s arm had worn off and he’d feel the pain. He wasn’t happy when he found out that they would be taking blood from his arm and not his port. He had a really bad experience when he first went to the hospital in Mqt back in March. No one could get the IV in and he ended up having bruises up and down his arms. So the lady in the lab took one look at his arm and said his veins weren’t good enough to take blood from so she’d have to take blood from another vein. Of course it was one that didn’t have the cream on. I’m sure you can imagine how Jacob took it when she stuck the needle in. They probably heard him outside. And do you think she got it in the vein? Heck no! And she kept moving the needle around trying to find it. I’m sure most of you know how good that feels! So while this was happening, another lab tech was walking by and asked if she needed help (I think she heard Jacob) and I said yes! She came in and tried one time on a vein that was under the numbing cream and got it right in. Jacob said to them in a very loud voice “Why didn’t you just do that in the first place?” I was thinking the same thing. It was so nice to leave and get out of there! Anyway, today was the first day of the Estate Sale at my Grandma’s house, so my sisters and parents took off this morning and I stayed with all 5 kids. They actually did pretty well! We had lunch, went to the park and they played nicely the whole day. Tonight we met them at an excellent Mexican restaurant in a nearby town for dinner. What a nice way to end the day! I think we’ll all sleep well tonight. Tomorrow is the second day of the sale, so I will stay here again with the kids. I think it’s supposed to rain, so I may go crazy having all the kids stuck inside. 🙂 We’ll stay here until Sunday and then head back to Rachel’s. I got the phone call later this afternoon from a nurse at DeVos saying that Jacob’s blood counts were good except for his Neutrophil count. It was really low! He can’t do chemo unless it’s quite a bit higher. So…we have to go back to G.R. on Monday, get his blood checked again and see if he’ll be ready for chemo on Tuesday instead. So frustrating! Hopefully Tuesday works out because we were hoping to head back up to Skandia on Wednesday. So now it could be Thursday, which would still be okay, but I hope it’s not put off any later than that. We want to see Ken so bad! They said that his bone marrow would just get tired after awhile and not produce as quickly. They were right! Here is a picture of Jacob at the pier. I don’t have one of him with his fish. Hopefully I’ll get that soon. Erin, your boys sound like regular boys!! Its so fun to read, although I know its trying for you. Pastor Ron and I keep praying for you and Caleb and your mom and dad. One day this treatments will be done. This is a hard thing you are doing, and we never know why we have to go through hard things, but we know that Jesus is with us all the time and helping us every minute of every day. -What did the two strings do in the race? -Why did the basketball player go to the doctor’s? He wasn’t getting enough shots! -What is the funniest bike? What did the flag say to the pole?